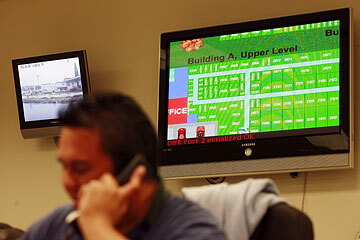 Up-to-date computer displays and video monitoring are part of the comprehensive security systems at Hawaii Self Storage in Pearl City. Sales Manager Greg Bolusan talks on the phone. When StorSecure LLC opens its 129,000-square-foot, 1,040-unit storage facility in Hawaii Kai in June, it will have much more than space for people to store the excess stuff they don't want to keep at home. It also will have a copy center, conference room, WiFi access, mailboxes for rent and fresh-brewed coffee. The Honolulu-based company isn't trying to go toe to toe with FedEx/Kinko's, the copy services giant, but simply hoping to serve customers who increasingly want more than simply a locker in which to store those family heirlooms that they can't bear to jettison. "We're not so much in the copy business as in the business of providing copying services for our customers," said Rusty Bird, who with his wife Linda will manage the facility. "It's kind of like a five-star hotel versus a three-star," said Annette Pang, a partner in StorSecure, which will boast a special dehumidification system designed to keep things free of mold and mildew. It's part of the new world of self-storage. Once the realm of people needing little more than a clean, dry and safe place to store things and a hand truck for schlepping things around, the industry now is offering enough amenities that people can run small businesses from the facilities. Pharmaceutical sales representatives, entrepreneurs running eBay-based businesses and professionals not wanting to waste high-priced office space to store reams of files are joining folks who use the lockers to store Christmas decorations and junk. 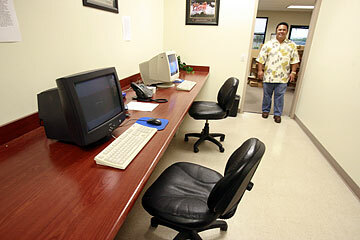 General Manager Daniel Ho of Hawaii Self Storage stands at the door of a computer center for client use. This is one of the many amenities offered at the facility. 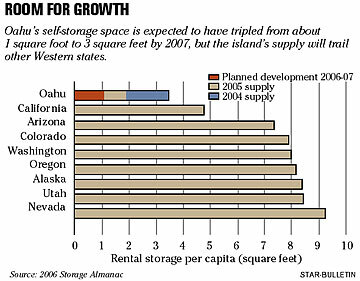 The trend is unfolding amid a boom in self-storage development on Oahu. The amount of space at self-storage facilities on the island has nearly doubled since 2004, from about 1 square foot per capita to just under 2, according to the 2006 Self-Storage Almanac. That's expected to increase further to about 3 square feet per person by 2007. All this comes as developers rush in to build condominiums that have little space for excess baggage. Developers say they're simply responding to pent-up demand. "We've had a good response, amazing response," said Pang, whose partnership in StorSecure will expand with the opening of a second facility in Kapolei. Steve Metter, chief executive of MW Group Ltd., has a 177,000-square-foot Hawaii Self Storage scheduled to open in Kaimuki in November. It's located across the street from another facility recently opened by Public Storage Inc. of Glendale, Calif.
Metter, whose firm owns and manages office buildings such as Honolulu's Pioneer Plaza, also owns Hawaii Self Storage facilities in Pearl City and Salt Lake, and has plans for additional places in Mililani and Kapolei. Metter projects that MW will have eight facilities altogether on Oahu by 2008. Like Bird and Pang, Metter said Hawaii Self Storage offers amenities like Internet access as a service to customers of its core storage business. Hawaii Self Storage and StorSecure are hardly the only companies offering such amenities. Among those also providing such bells and whistles are SelfStorage1 in Kakaako and Akamai Self Storage in Ewa Beach. Gone too, it seems, is the image of self-storage facilities as monolithic entities run by faceless managers from faraway head offices with no connection to the community. Although many companies, including the mammoth Public Storage, are run from the mainland headquarters, others are fashioning themselves as local companies rooted in the community. An artist's rendering shows StorSecure's Hawaii Kai building that will open in June in Hawaii Kai Towne Center. The 129,000-square-foot, 1,040-unit storage facility will have a copy center, conference room, WiFi access, mailboxes for rent and fresh-brewed coffee. A ground-breaking ceremony was held in December for StorSecure's Kapolei self-storage facility, which is shown in an artist's rendering. The architectural features of the structure are designed to fit in with the neighboring buildings in the city. MW Group's Hawaii Self Storage, for instance, gives away eight $1,000 scholarships each year to college-bound seniors from public high schools in the neighborhoods where it has facilities and continues to provide the scholarships for the duration of the students' careers if they maintain a B average. Five A Storage in Kapolei sponsors events such as the Taste of Kapolei and Sunset on the Plains, as well as baseball teams and scholarship funds. And StorSecure plans to support community groups through promotional programs and to hold outreach programs and events to connect with the community. The developers have altered their design in response to community concerns and are spending extra money for exterior finishes, Pang said. In fact, today the company is holding an outreach meeting at the Chef's Table restaurant in Hawaii Kai to update people on the project's progress. "We're in business because we have the support of our customer base," said Rusty Bird. "And if we want to remain in business, we have to figure out a way to give something back." Illustrating StorSecure's desire to connect with the community is the hiring of the Birds as managers. Each has more than 20 years experience in industry, Linda as a telephone engineer and Rusty as a general contractor. Perhaps more important, they have multifaceted personalities that enable them to connect with people. The couple also has used hypnosis to help people quit smoking, restore vintage cars and play music together with Linda on acoustic bass and Rusty on banjo and mandolin. Finally, Rusty does relief carvings on eggshells and is an evangelical pastor. Pang said it was important for the company to hire a team of managers who were centered, mature and well-rounded enough to connect with customers. "If you get someone who's untethered or just floating in the wind, they'll never be able to sort out those problems when they encounter them," Pang said. The company is looking for another team of managers for its Kapolei storage facility, Pang said. A benefit of the job: A free one-bedroom apartment on the site for the managers. "And they can even have pets," Pang said. Gary Villanueva and his wife, Doreen, both of janitorial firm ACV Management, take advantage of the large elevators to move a bed frame from their storage space at Hawaii Self Storage in Pearl City. 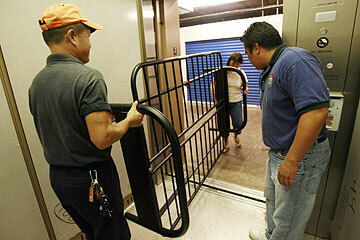 Hawaii Self Storage Sales Manager Greg Bolusan holds open the door for them. The main question now seems to be how much more room is there for growth. Rusty Bird says supply and demand tend to reach a healthy equilibrium when there's about 4 square feet of space per capita, which means that there will be some more room for growth on Oahu beyond what's already planned here. But most western states have far more than 4 square feet per capita; in fact, according to the Self-Storage Almanac, Nevada has a whopping 9 square feet. Whether Oahu's unique position as a highly desirable island locale with limited land will enable it to buck the national trend is unclear, but it seems certain that companies that have gotten in early will have an advantage in an atmosphere of soaring land prices. Metter said Hawaii Self Storage has paid an average of $32 to $33 per square foot in land and construction costs, which he said will enable it to keep its fees somewhat low. Facilities along Kapiolani, by contrast, have paid $200, Metter said. "Our strategy is to provide a very high quality facility with high quality service at a fair price," he said. Laurie Saffery, facility manager of A-American Self Storage's downtown location, said she's curious to see how it all shakes out. Saffery's company has been around for 30 years, and runs a fairly simple operation. She said she worries more about some of the more luxe facilities that might find themselves having to cut rates to compete. "There's going to be a lot more competition," Saffery said. "It's going to be ridiculous."